On this page are instructions for how to make a paper nursery lantern and star cluster ceiling mobile. When a mom sent in some pictures of her baby boy’s nursery with a nursery ceiling mobile made from accordion pleated paper lanterns and stars, everyone started to email wanting instructions and a supply list, so here we go. How many paper lanterns and stars will I need? The answer depends on how large or small a mobile that your nursery can accommodate. Three sets of accordion pleated, round paper lanterns and one large paper star should cover the needs of an average sized room with a few round lanterns left over. Where Should I Hang the Nursery Ceiling Mobile? Hang your arrangement of paper accordion lanterns and stars in an area of the room where it will have visual impact but keep in mind that it should be within your baby’s line of vision whether your little one is in the crib, the rocking chair or in the changing area. Get the supplies that you need here. 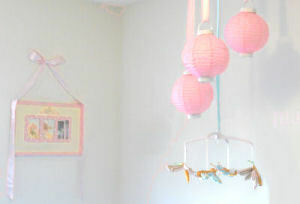 A nursery ceiling mobile made with paper lanterns and pom poms is an inexpensive way to add color to the room. Add decorations to reflect the nursery's theme to personalize your DIY craft project. I Have a Small Nursery! A large paper lantern cluster is great for a nursery with tall ceilings but if your baby’s room has standard 8-foot ceilings; just scale it to size. Use fewer lanterns or only the small ones in the package and save the big ones to use as patio lights for your next party. A bonus is that the paper nursery lantern cluster will make a small space seem bigger by drawing the eye upward. First you should make a bracket to mount it to the ceiling made from wooden dowels or whatever you can find around the house to make a grid similar to this one in the size you need for your arrangement. The hanger can be much smaller than you might imagine since you will be using strings to attach and layer the nursery lanterns and stars. 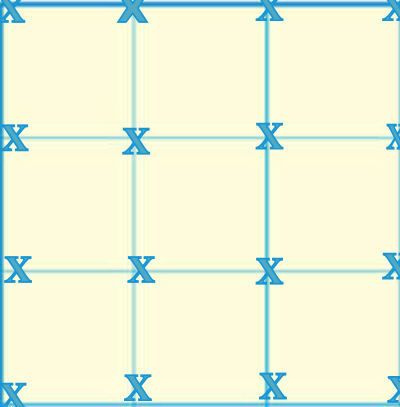 Use twist ties or sturdy wire to connect the dowel rods everywhere you see a big, blue "X" on the grid. 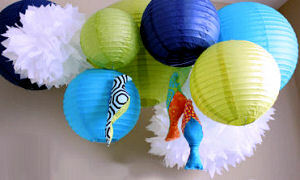 Consider spray painting the hanger to blend with the colors of the paper lanterns that you plan to use. Holding the hanger in position on the ceiling, take a pencil and mark where you feel you will need to locate the hooks to support it. Use twist ties, yarn or some type of cord to attach the bracket to the eye hooks making sure that it’s securely mounted and that there is absolutely no danger that it could fall. Use your own judgment on this! Now you can start to add your paper nursery lanterns, paper stars, garland and any other paper decorations that you want to your ceiling cluster making sure that whatever you add doesn’t overload the weight limit of the bracket. Consider adding silk butterflies or dragonflies for interest. The great thing about this decoration is that it’s so easy to make yourself. And for the profound decorative statement that this arrangement makes; it’s cheap as far as decorations for a baby's room go costing about the same or less than many baby mobiles. Some moms have commented that the paper stars and nursery lanterns in the arrangement would present a dust-catching problem. Nobody wants to spend their time dusting when they could be spending time with their newborn. The best way to keep your mobile dust-free is to shake it and use the extension of the vacuum cleaner to catch the fallout. One mom said that she was afraid of something that large falling on her baby. The thought of anything falling on a baby is unimaginably horrible. The key to preventing such a tragedy is to securely attach the hanger to the ceiling so that it will not come apart. Also, the decorations should be as lightweight as possible. If you still have fears; skip it. The cutest mobile on earth is not worth losing sleep over. Please make plans to visit Unique Baby Gear Ideas soon to see more tutorials and to share pictures of decorations that you make for your little one's room! Did you make an amazing mobile using paper lanterns? We would love to see it! Do you have a picture of the crib mobile? Please share a picture!